BOSTON (November 16, 2017) – Major League Lacrosse (MLL), the premier outdoor professional lacrosse league, announced today the Rochester Rattlers will relocate to Frisco, Texas and will be rebranded as the Dallas Rattlers for the 2018 MLL season. The team will play its home games at Ford Center at The Star in Frisco, the Dallas Cowboys World Headquarters and practice facility and the site of the 2017 MLL Championship Game. Bill Warder, who has served as an assistant coach with the Rattlers since 2007, will be the head coach. Warder played in MLL in 2001 and has held coaching roles with the Rattlers and his alma mater of Hobart College since his playing career ended. A native of Geneva, N.Y., Warder was an assistant coach on B.J. O’Hara’s staff when Rochester won the first MLL Championship in franchise history in 2008. Ford Center is a 12,000-seat indoor facility on the campus of The Star that hosts the Dallas Cowboys World Headquarters and serves as the team’s practice facility. It opened in August 2016 and hosted the 2017 MLL Championship Game that saw the Ohio Machine win the first league title in franchise history. The facility serves as a focal point to the sports and entertainment district that offers fans the ultimate experience with over 15 restaurants, the Dallas Cowboys Ring of Honor Walk, an Omni Hotel and the Tostitos Championship Plaza. “When we set out to build Ford Center and The Star we envisioned finding new and innovative ways to engage our youth and community specifically. We believe bringing the Dallas Rattlers here does that and also grants us new opportunities to give people the Cowboys experience,” said Stephen Jones, Chief Operating Officer of the Dallas Cowboys. New Balance will continue to own the team and the Rattlers will be the first MLL franchise in the state of Texas and the only team to play in the Central Time Zone. Prior to hosting the 2017 MLL Championship, the Lone Star State was the site of the 2015 MLL All-Star Game in Houston. Frisco has been nicknamed “Sports City U.S.A.” as the Rattlers will be the seventh professional sports franchise to call the city home. Located in the north end of the Dallas-Fort Worth Metroplex, Frisco is home to the Dallas Cowboys World Headquarters, the Dallas Stars corporate headquarters and practice rink, FC Dallas of Major League Soccer, the Texas Rangers Double-A affiliate, the Frisco Roughriders, the Texas Revolution of Champions Indoor Football and the Texas Legends, the G-League affiliate of the Dallas Mavericks. Frisco also hosts FBS football’s Frisco Bowl, the FCS Championship Game for Division I college football, and the Conference USA Basketball Championships. Last season, the Rattlers went 8-6 and qualified for the postseason for the eighth time in franchise history. They were eliminated by the Outlaws in the MLL Semi-Finals, 15-8. The Rattlers were managed by David and Wendy Dworkin during the 2017 season and returned to play at Capelli Sport Stadium. 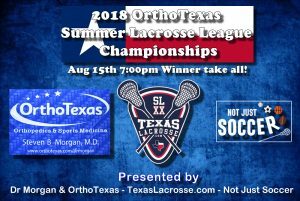 They are one of the six original franchises that began play in MLL in 2001 and won the Steinfeld Trophy in 2008 with a 16-6 win over the Outlaws for the first Championship in franchise history. The team relocated to Toronto before the 2009 season, but resumed play under the Rochester Rattlers brand in 2011 when the Chicago Machine relocated to Rochester. For information about the Rattlers, please visit DallasRattlers.com and follow them on Twitter (@RattlersLax), Facebook (@RattlersLax) and Instagram (@rattlerslax). Major League Lacrosse (MLL), the premier professional outdoor lacrosse league, was founded by Jake Steinfeld and is headquartered in Boston. MLL has continued to lead the sport of lacrosse into the mainstream of competitive team sports since 2001. The league is made up of nine teams: The Atlanta Blaze, Boston Cannons, Charlotte Hounds, Chesapeake Bayhawks, Dallas Rattlers, Denver Outlaws, Florida Launch, New York Lizards and Ohio Machine. The Star is the 91-acre campus of the Dallas Cowboys World Headquarters and practice facility in Frisco, Texas. Developed as a first-of-its-kind partnership between the City of Frisco and Frisco ISD, The Star features Ford Center, a 12,000-seat stadium that hosts Frisco ISD football games and other events; Cowboys Fit, a 60,000 square-foot gym developed in partnership with leading fitness developer, Mark Mastrov; and Cowboys Club, a members-only club where the country club meets the NFL. Throughout 2017, The Star will welcome The Omni Frisco Hotel, a 16-floor, 300-room luxury hotel; Baylor Scott & White Sports Therapy & Research at The Star, a 300,000 square-foot center of excellence for sports medicine; as well as a variety of shopping, dining and nightlife options. For more information on The Star, visit: http://thestarinfrisco.com/.